Initiations: Whittier College has initiated in the past some very important measures regarding the reduction of food waste at the Campus Inn (CI). 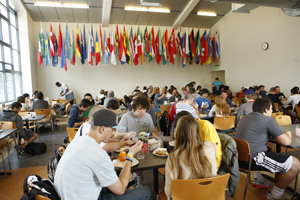 An initiative to record the food waste in the CI was started in the 2009-2010 class year by the coordinator of Environmental Studies program Sal Johnston, and his food systems class. Back then, the CI was not using trays and the group wanted to get a baseline of the amount of food waste before any reductions in food waste were attempted. Everyday for one week, the students would go into the CI during lunch hours and weigh everything that was tossed(including plastics and even liquids). The food waste count at the CI required three people per shift. Results: The results proved somewhat astounding as people ended up throwing away on average 10 to 12 ounces of food away each day before the trays were removed. Once the trays were removed, another count was set up and the average per capita came out to be simply 3 ounces of food waste versus the original 10 to 12 ounces. Not only did the removal of trays reduce food waste, but it actually saved the school a total of $30,000 dollars. Future Prospects: The same Professor, along with the Sustainability Club and Environmental Science/Studies Faculty are in the process of formulating another similar count in order to analyze the shift in mindset that the Whittier Poets might have adopted since the removal of the trays in hopes of only furthering the school’s measure for reducing food waste. Food waste could also become a viable ingredient for composting if used correctly.